With the upcoming World Championships in Osaka less than a month away, I couldn’t help but reflect on the 2001 World Championships which were held in our “backyard” in Edmonton, AB. How many races are won and lost at the finish line? And I’m not referring only to the 100 meters. Long sprinters, 200m and 400m and 400m hurdlers, should also practice leaning for the tape. Lee Evans was the master of leaning at the tape, as Bud Winters would train their athletes to lean after a certain amount of steps. I try to teach them that during the last three strides they must Push! Push! and Dip! They must push hard at the ankles and in the last stride drop the head and bend at the waist and throw the hands back and to go past the tape to 401 or more meters. 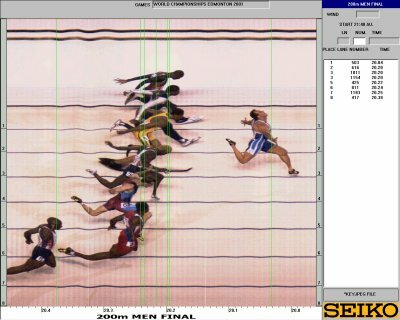 This photo-finish symbolizes how important it is to lean at the tape, even if you aren’t in first place, won by Greece’s Konstantinos Kenteris at the 2001 World Championships Men’s 200 meters. Click on the image and tell me who came in second or third place. Or even out of the medals in forth place! You know the old expression: To win the Kentucky Derby, you don’t have to beat your competitor by a horse length. You have to simply win by a nose.